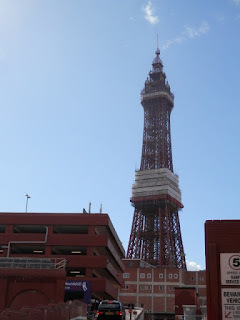 Moments of Adventure: Blackpool Rocks? 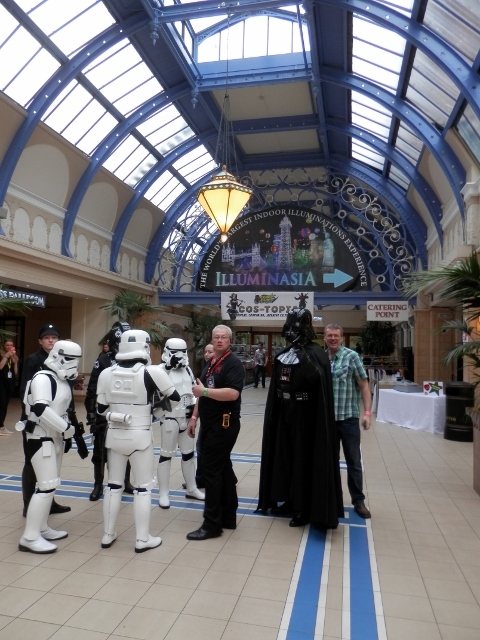 With so many comic conventions to choose from these days it's a tough call as to which we can do but when we heard about a new show in Blackpool, which is only an hour's drive or so away, we were interested, when we saw their impressive line up of actors from Star Wars, Game of Thrones, Harry Potter and Thunderbirds, we became very interested and when we heard they'd sold in excess of 8,000 tickets we booked! The potential of another big local comic show was too good to miss but how would it shape up? 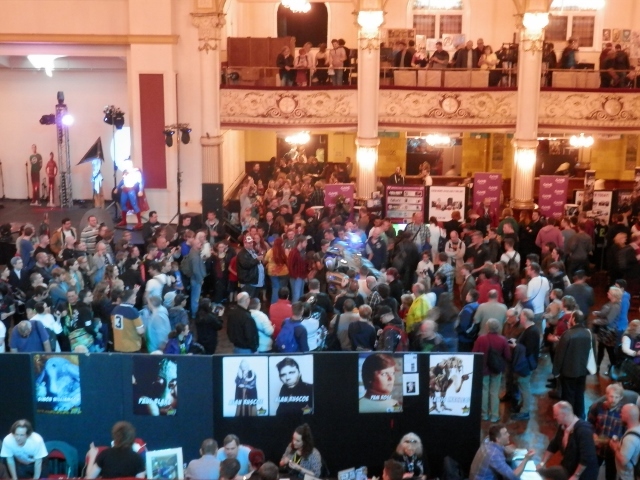 We'd already tried several debut shows this year, namely Aberdeen's wonderful Granite City Comic-Con, Birmingham's inspiring Comic Festival and Warrington Market's surprising Comic-Con. Blackpool, like all those new shows sensibly chose, to make their first convention a one day, 'Saturday only' affair but helped by their impressive media guest list they sold out of tickets well in advance meaning that on the day, despite being a wonderfully high profile busy central location, you couldn't just turn up and pay on the door. 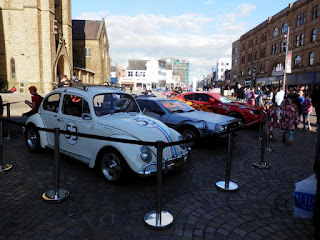 Movie cars in Blackpool's busy shopping centre! Still with that 8k+ tickets sold what could go wrong? Well I think we as exhibitors got off lightly as, although the pre-show information was poor and there was some uncertainty with getting in and finding our spot, (late comers found they had no spot!) we did find and settle into our allocated balcony table and quickly got set up for the show anticipating the busyness to come. Can you spot the Accent UK balcony table ? The show opened at 10 but upstairs in the balcony you wouldn't have known, it seemed like an age before anyone actually came upstairs, confirming our fear of the multi-roomed labyrinth location swallowing up the punters. But we were oblivious to the chaos outside where indeed, at least 8k ticket holders had turned up and couldn't get in. I think it took about 2 hours before our first sale, but it remained very quiet, then around 12:30 or so things took off and the trickle of browsers became a flood and we struggled to keep up with them all as our books began to fly with the recent Zombies reprint quickly selling out, then mid to late afternoon, it slowed and died again as visitors evaporated. From our customers we heard of 2, 3 and 4 mile queues snaking round and round the building while staff struggled to cope with the crowds, apparently bringing the Blackpool traffic to a standstill! Finally the convoluted entry system was abandoned and the crowds swelled in which was great for us and our sales but not so great for the punters who, once inside had no floor plan, no programme and no schedule of where the various media guests, panels and (pre-paid) photo shoots were taking place. That and the overcrowding and problems with disabled access left many people very disappointed with their comic-con experience. 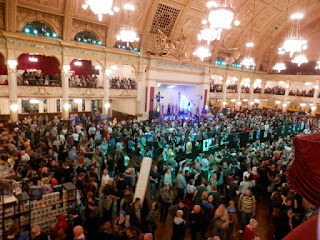 It's a tough one for us as we of course want the crowds and we're so busy manning our own table we're largely oblivious to anything else going on and so it was at Blackpool. 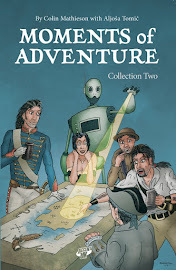 We enjoyed our day, meeting new readers, seeing great cosplayers and catching up with comic show regulars such as Mike Garley, Nick Brokenshire and Sumyra of Lucky Target Comics. Despite our very odd sales pattern, we comfortably covered costs and finished with our second best ever one day tally, (Yes Morgan & Chris you're number one!) proving that we'd found a new audience for our books. Dave and Scott man the table! It's really subsequently that I've heard more and more of people's disappointing experiences with threats of legal action against the organiser's which have cast serious doubt whether there will be another one. That would be a real shame as Blackpool proved that there is a huge appetite for another regional comic show so we'll have to see if lessons can be learnt and a way forward found to deliver a safe and popular show to cater to the fans. One thing we do have though is even more respect for the organiser's of the shows that we attend, we don't get to see or hear of whatever issues might be affecting things behind the scenes. A well run show is so smooth, we and visitors just concentrate on having fun and enjoying the experience without worrying about anything else, so hats off to all you unheralded show organiser's out there, if we don't notice you its because you're doing your jobs right! 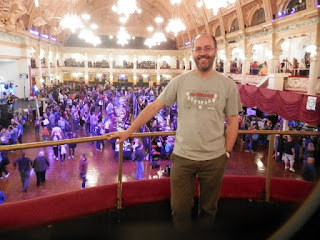 That is particularly true of the afore-mentioned 2015 debut shows at Aberdeen, Birmingham and Warrington, where they may not have had the huge crowd that Blackpool had (although Aberdeen came close), and no doubt had some teething issues along the way, but my recollections are of have fun, enjoyable trouble-free days, promoting this wonderful world of comics which of course is what its all about, so thank you and good night! I'd not heard about the legal action Colin but I guess if what we heard about people selling the tickets on Ebay for an inflated price, then people would be very upset if certain scheduled events failed to happen. It's a shame as it'll probably put the organisers off of doing another one and as we've found, they get better as they learn what they need to do to make events like this a success for everyone. Yeah Dave, I understand that there's a huge negative debate on social media about the various 'misteps' of which the ebay sales apparently may be the least! That said with the demand there, it would be a great shame if Blackpool doesn't follow up with another show next year, we'll have to wait and see.